Here in Massachusetts, we’re getting hit with ads for a Burger King test campaign, during which they’re serving “brunch” until 10:30 AM. The first problem here is that a real brunch doesn’t end at half past ten. The second, much bigger, problem is that nothing at Burger King could ever qualify as actual brunch food. Hard-hitting news organization CNN has the full story on the Burger King Brunch menu. A breakfast sandwich made with scrambled egg, cheese, tomato, ham, bacon, and smoky tomato sauce is available. That’s sort of brunch-y, I guess. 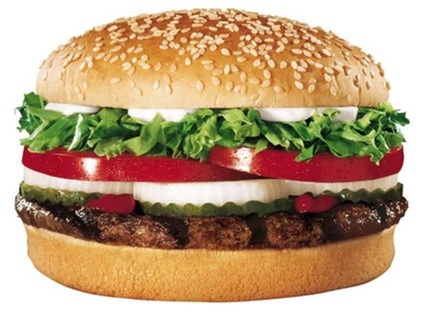 Also on sale is the Whopper, which normally can’t be purchased so early in the morning. Because nothing says brunch quite like a 670-calorie hamburger with 60% of your recommended daily allowance of fat in it. See? I’m sure this disclaimer was placed during a shot of a scantily-clad woman by sheer coincidence. But you can see it. It’s right there, in tiny text under the hot blond in short shorts slurping on a…I’m sorry, what were we talking about? Perhaps that’s a problem, yes. It seems to me that there’s a bigger problem here worth raising though. You see, drinking alcohol once you’re 21 is fine to do. But drinking soda at 7 in the damned morning? That’s never ok.